Little League Football is open to boys and girls aged 5-13. 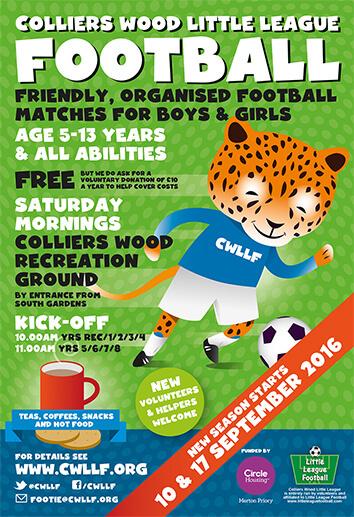 Our season starts on 10th September 2016 and is a voluntary run organisation that play at Colliers Wood Recreation Ground during the Autumn and Winter school terms. Find us there on Saturday mornings from 10:00-11:00am for Reception-Year 4 children and then 11:00am-12:00pm for Year 5–Year 8. Please go to www.cwllf.org for more information and find our Facebook/Twitter links for updates on.